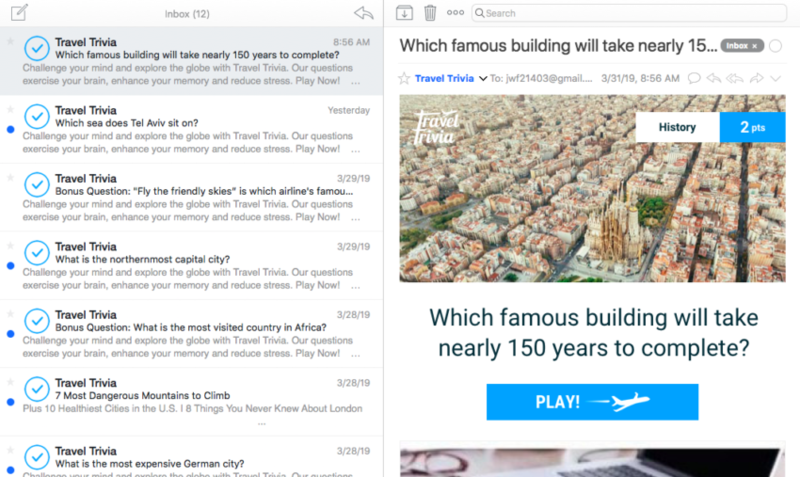 A few weeks ago, I started to get some emails from a company called Travel Trivia. I don’t recall signing up for their emails and to be honest, I was a bit irked at first. It was not just an occasional email. I got two in one day! And then three! But just as I was about to dive into the email to unsubscribe, something strange happened. Now I am not a fan of communicating with your clients on a hyper frequent schedule—I personally try to limit my emails to once per month. But there was something about this that was different. For me, it provided a few breaks throughout the day to refresh and exercise my brain. Unsubscribing would have to wait. I started to look into the site. It was an older site and the owners were obscured. 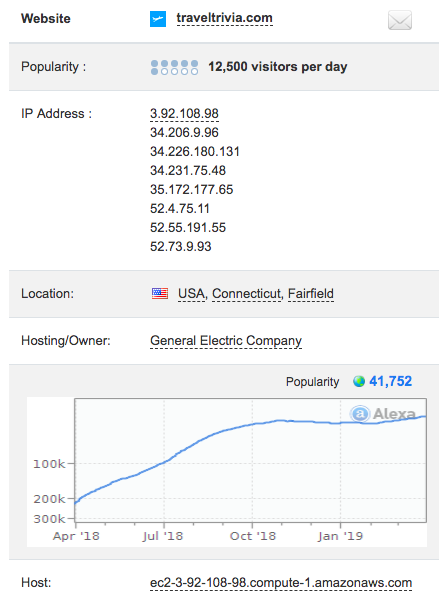 Hosted on an Amazon server with some big name companies. But aside from some generic affiliate banner ads on the site, there were no outward signs of sales pitches. Aside from the trivia questions, nothing screamed travel. And then after a while, it happened. A pop up asking if I wanted to update my “email preferences” and of course one of the choices was “travel deals”. Mystery solved. But what a great idea. I still am not sure who is behind it, but judging from their traffic and the incredible growth over the last year, they are poised to generate a lot of business. I will be keeping an eye on it. And playing trivia! But how does it relate to you? Implementing something like this would be a piece of cake on your Facebook page or (preferably) website via your email program. Think of the sales funnel. Toss out a question about a destination (say London) the focus will be on the question, but also on the page is information on other products that might appeal to someone that has already expressed an interest in London. Maybe Paris, Prague, Barcelona. Maybe you keep it centric to the UK. Creating a template for a trivia page is easy. Just fill it with content and then direct people to it. Facebook: Today’s Trivia Question: Who is responsible for the grid and circle layout of Washington DC? Your Site: Pierre L’Enfant. With links to some DC deals, maybe a photo album of pictures of DC, or a blog post about that trip you took last year to DC. And the killer, an email solicitation requesting them to sign up for more information. It would be easy enough to come up with 365 questions and then create 365 pages with all sorts of links to other resources to engage people. And then start to schedule the posts to appear on my social platforms. It might take some time but once you are rolling, you can actually get ahead of yourself. My brain is churning on this. How ‘bout yours? The TSA: Government Employees? Or Broadway Actors? Ever since the inception of the Department of Homeland Security, I have been a skeptic. As I watched the Transportation Security Administration (TSA) evolve since the attacks in 2001 it always seemed to be a reactionary organization and one run with a decided absence of logic.